Microsoft's chief executive Steve Ballmer has insisted that there is "nothing magic about Google" as the two giants continue to compete in several sectors. Although Google is the 300-pound gorilla in search, Microsoft dominates in many other arenas and Ballmer does not believe that Google's Chrome OS rivalling Windows 7 poses a major problem. "There's one business – search – in which Google is very strong," Ballmer told the BBC. "And sure, it's the toughest competition. "We have here in the UK a 3 per cent market share and they have 85 per cent, but in a sense that's kind of fun. Every day is a good day. You get the chance, every day, to improve. "In the other areas Google effectively has no market share." When pushed on Google's increased focus on areas that have traditionally been dominated by Microsoft, Ballmer added: "We've had plenty of competitors come after us for years. There's nothing magic about Google." Ballmer has always been an ebullient figure, and it is clear that Google has the kind of financial might that many of Microsoft's other competitors have not, but the Redmond company has mixed it with the likes of IBM, Yahoo and Apple for years and is ready for the fight. At the centre of that is the eagerly-awaited update to Microsoft's flagship OS, Windows 7, and the positive response to the Vista successor has buoyed the company. 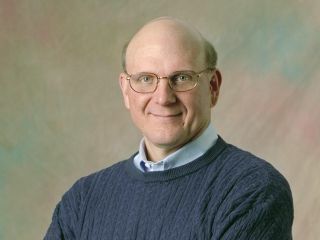 "The initial reaction, or most of it, on the blogosphere et cetera, has been incredibly positive and I'm expecting an incredibly good launch," added Ballmer. "The system will feel more responsive, simple and clearly more engaging to use. Beyond that it's got dozens of new features and every user will find four or five they fall in love with."